Today is the feast day of St. Catherine of Siena. To celebrate, here is a short biography of Catherine from Saints, A Visual Guide. One of Italy’s most celebrated saints, Catherine was born in Siena in 1347 as the youngest of the more than twenty children of the Benincasa family. Refusing to comply with her parents’ wishes that she should marry, she became a Dominican tertiary at the age of eighteen. She dedicated herself to the care of the sick and dying, and particularly to victims of leprosy and of the plague, which she herself caught though she survived it. In her later years she involved herself in politics and became an advisor to popes. At a crucial point when the papacy was in danger of falling under the control of the French monarchy, she was instrumental in persuading Pope Gregory XI to leave Avignon and return to Rome; and she subsequently helped Urban VI retain the papacy at the time of the Great Schism in the Church. Although she never learned to write, Catherine dictated over 380 letters, some of which are political in nature while others have become classics of mystical theology. She died in Rome in 1380, was canonized in 1461 and was declared a Doctor of the Church in 1970. Catherine’s spirituality expressed itself in mystical visions, and she is one of the notable saints to have received the stigmata. In one of her visions, as she reported, Jesus offered her the choice of an earthly crown or a crown of thorns, and she chose the crown of thorns. In another vision she saw herself mystically wed to Jesus, from whom she received a ring. Fra Bartolomeo has portrayed this scene in his Marriage of St Catherine of Siena in the Louvre. The commonest portrayals of Catherine show her as a Dominican nun, with a lily (of purity), a crucifix or a book, or wearing or receiving a crown of thorns. Her hands may show the stigmata. 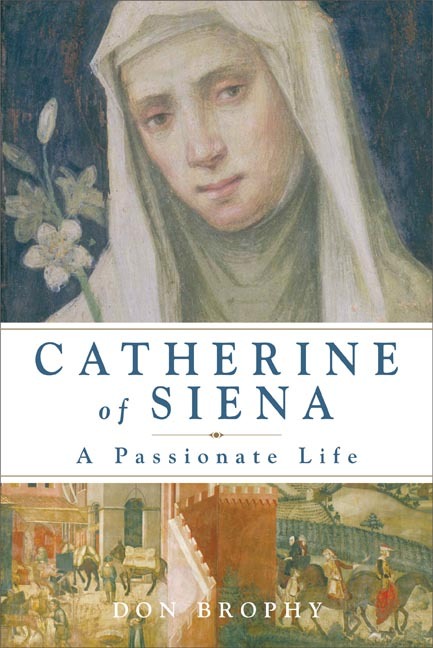 For further reading on St Catherine, have a look at Catherine of Siena, A Passionate Life. ← Get Thee to a Nunnery: The Beautiful Queen of Peace Monastery in B.C.